As the days lengthen, the stars of the Winter Triangle fade into evening's dusk. The "Big Dipper" asterism (Ursa Major) is well placed for viewing this month since it is almost directly overhead. Follow the curve of its handle to Arcturus (Bootes) and continue on the curve to Spica (Virgo). Regulus (Leo) is on the ecliptic (the path traced by the planets and Moon), just W. of overhead. Further W., on the ecliptic, find the Gemini Twins, Castor and Pollux, and finally the Pleiades asterism of Taurus. MERCURY visible in the morning sky, the planet will be 28 deg. from the Sun as viewed from Earth. VENUS low in the morning sky in the northern hemisphere. MARS in Taurus can now be compared with the orange star Arcturus (-0.4 mag), although the red planet will not compete this bright, Spring beacon at about 1.5 mag. JUPITER rises after mid-night and remains in the constellation of Ophiuchus. SATURN in Sagittarius rises well after 3 in the morning. URANUS will be in conjunction with the Sun on the 22nd and cannot be seen this month. NEPTUNE emerges into the morning sky this month and should be up for telescopic viewing. 02 Venus 3 deg. N of Moon. Mercury 0.4 deg N. of Neptune. Mercury 4 deg N. of Moon. 09 Mars 5 deg N. of Moon. Venus .3 deg. S of Neptune. Jupiter stationary, afterwards the giant planet begins retrograde motion. 13 Moon in Beehive cluster (M-44). 22 Uranus in conjunction with Sun. 23 Lyrid meteor peak. The shower is estimated to contain 20 meteors at peak, this year the Moon is 4 days past full (88% illuminated) and may interfere with observing. Jupiter 1.6 deg S. of Moon. 25 Saturn 0.4 deg N. of Moon, occultation from E. Australia, New Zealand, W. South America. No constellation roars Spring like Leo the Lion. This month Leo will be high in the sky long before mid-night. This constellation was known by many cultures as a Lion. The ancient Egyptians identified the stars of Leo with the Lion. When the Egyptians used the heliacal rising of the star Sirius to tell them that the Nile was going to flood, they also saw the head of Leo popping over the horizon at the same time. Lions traveled out of the desert to escape the scorching summer heat on the banks of the Nile. Even the Sphinx whose body resembled a recumbent lion may have been inspired by the constellation of Leo. The Greeks and the Romans saw the constellation Leo as a Lion, who was terrorizing the people of Nemea. The king of Mycenae sent Hercules to defeat the Lion as the first of his 12 labors. Because its hide was impenetrable Hercules had to strangle the lion with his bare hands. In order to return its skin to the king, Hercules discovered that he could use the lion's own nails to tear through the hide. The Lion of Leo commemorated this act and some star charts actually show Hercules standing on the Lion's head as the constellations are next to each other in the sky. The brightest star of the constellation, Regulus is located less than a degree away from today's ecliptic. Regulus, or Little King, is joined by the Moon every month, with an occasional occultation visible from some locations on Earth. It is also considered the heart of the Lion. Regulus marks the bottom of the "backward question mark" or "sickle" of the Lion constellation, creating the base for the mane represented in this star chart by the named stars Algeiba and Algenube. Algeiba (Gamma Leonis) is the brightest star in the Sickle. Algeiba is a double star although not easily resolved in smaller instruments. Gamma Leonis is also the radiant point of the Leonid Meteor shower, made famous by its fantastic displays at 33 year intervals. This shower is replenished by the comet Tempel-Tuttle that has a period of 33.176 years. The best showers occur after the comet passes Earth's orbit as it did in 1999. From the head of the lion, to the rear, the star Denebola marks the hind end of Leo's body. 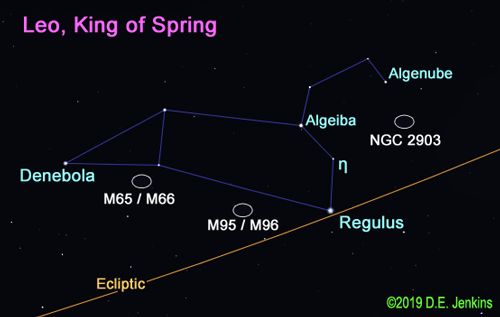 At magnitude 2.11, Denebola is matched up with the bright stars, Spica and Arcturus to become known as an asterism, the "Spring Triangle." Add Alpha Canis Venatici (known as "Cor Caroli") and you get the "Diamond of Virgo." Sometimes the Spring Triangle utilizes the brighter star Regulus instead of Denebola. Leo is not located near the arms or central bulge of the Milky Way, but in an area of the sky that has fewer background stars, enabling human observers to see many of the galaxies that lie outside and many light years away. Robert Burnham listed no stellar or globular clusters for Leo in his monumental work Burnham's Celestial Handbook. Leo is home, however to many galaxies including a few that can be observed in a single field in small telescopes or wide-angle instruments like M-65 and M-66 that are a mere 21' apart. They are bright enough at apparent magnitude 10.3 and 8.9 respectively to be detected with binoculars at a dark site. An additional galaxy NGC 3628 complete what is called the "Leo Triplet." The image I present here was taken by Hunter Wilson and licensed under Creative Commons. I have oriented the image with NGC 3628 at the top because it looks most like the nickname it was given by astronomers, "The Hamburger Galaxy" in this view. M-66 is below the hamburger to the left of the image and M-65 is the more classic looking spiral to the right. Each of these galaxies is classified as spiral type by Burnham: M-66 is listed as Sa/Sb, M-65 and the Hamburger galaxy are listed as Sb. The Hamburger galaxy is aligned almost edge-on with respect to Earth, M-65 is tilted about 14 deg. a viewed from Earth. M-66 is also inclined to us and displays elongated arms that signify tidal interaction with other members of in this group. It is the largest galaxy of the trio, comparable in size to the Milky Way, about 100,000 light years across.. M-66 has been noted as peculiar as its spiral arms are not in the same plane as the central bulge. It is a barred spiral - - the bar is visible here as a whitish structure in the center of the galaxy. The bar itself is not currently forming new stars, but stars are forming at the ends of the bar. There are many fine images of these galaxies available on the web. Leo is really loaded with galaxies, M-96 is a Milky Way sized spiral. It is the largest member of its group that includes nearby M-95, a great example of a barred spiral and M-105, an elliptical galaxy with a super massive blackhole at its center. 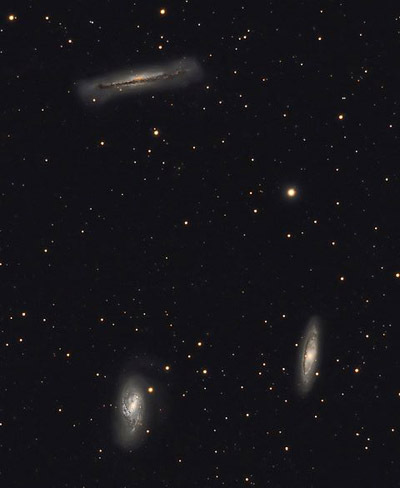 These galaxies, together with some nearby NGC galaxies are part of the "Leo I Group." There are 12 bright galaxies in this group, The M-66 group and the M-96 group, joined together with the NGC 3489, a lenticular galaxy located midway between the 2 groups. The collision of M-96 and NGC 3384 over 1 billion years ago is believed to have ejected a cloud of hydrogen and helium gas that has formed a giant ring in space that is now known as "The Leo Ring." A bridge of gas connects the ring to M-96. It has been studied and found to be of galactic nature (rather than primordial). Today it is 650,000 light years across. Another outstanding galaxy in Leo is NGC 2903, located near the forehead of the Lion. The galaxy is smaller than the Milky Way, about 80,000 light years across. At magnitude 9.7, it was surprisingly missed by Charles Messier. There are many more galaxies in Leo, too many to present here! Please don't expect the view in your amateur telescope to look like the CCD images taken by amateurs or with high-powered professional instruments like Spitzer and Hubble, The joy of finding these faint objects light years away is an impressive accomplishment. These galaxies are deep sky wonders that we call "faint fuzzies." Another interesting stellar object in Leo is the star Wolf 359. It is one of the nearest stars to the Sun, a mere 7.8 light years away. It is one of the smallest stars ever detected with a radius of 69,176 miles or 111,328 kilometers. It has been included in Star Trek stories so if the name sounds familiar, you probably heard about it there. It is possible that there are many such stars in the universe, but they would be so faint that they might not be detected at great distances. Lastly, there is a variable star, R Leonis, whose magnitude ranges from 5.8 to 10.0 with a periodicity of 312 days. This star is categorized as belonging to the Mira type class of long period variable stars. Because it is so bright, small instruments can pick it up and it is widely observed by amateurs.